Creekside Animal Clinic has a varied, multi-species practice and in our years in Vernon, BC, we have worked on some unusual patients and interesting cases. Here are just a few examples of some of the memorable cases in our history. Wondering what your pet’s symptoms mean? Visit our Resources page for more information or schedule an appointment at Creekside Animal Clinic. 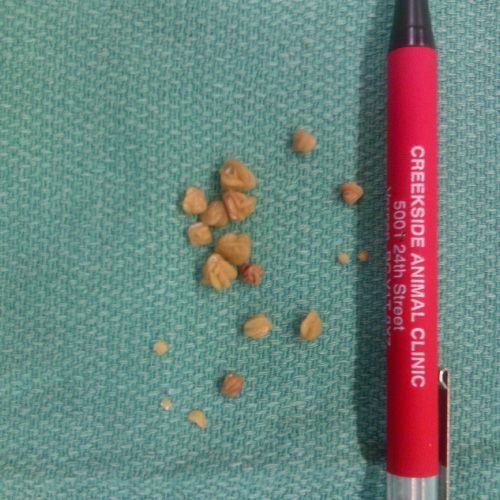 Bladder Stones Treated without Surgery! 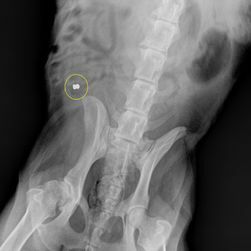 Bladder stones are accumulations of minerals such as calcium, phosphorous and magnesium that are normally dissolved in the urine of animals, as well as people. Under some conditions – especially bladder infections – these minerals do not stay dissolved but form stones which cause irritation and sometimes pain. 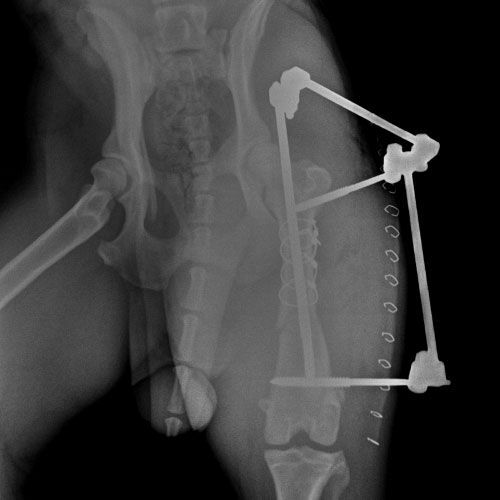 See how we diagnosed and treated this condition – without the need for surgery! Angel is a 4 year old spayed female Bichon Frise dog. She developed signs of a urinary tract infection in September 2016. Angel showed signs of discomfort when she urinated and produced small amounts of urine more frequently than usual. There seemed to be some blood in her urine. A test performed on Angel’s urine confirmed she had a urinary tract infection and antibiotics were prescribed. Ten days later Angel started to strain again and had a small amount of blood in her urine. An x-ray was taken. 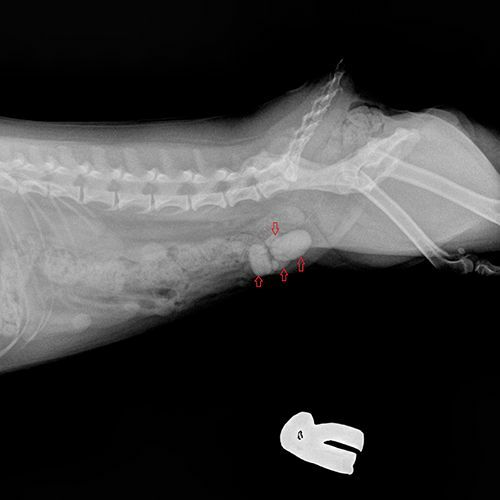 Four bladder stones (red arrows) were seen in Angel’s bladder. 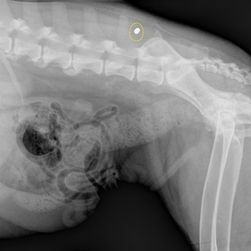 We discussed with Angel’s owner the possibility of dissolving the bladder stones using a veterinary prescription diet and antibiotics. The alternative procedure would entail removing the stones surgically. Angel was rechecked three weeks after starting the prescription diet. 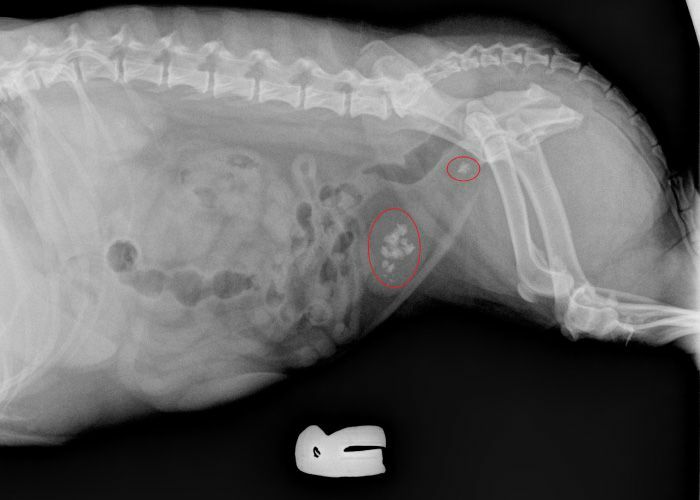 A second X-ray was taken and showed that the two smaller bladder stones had dissolved. Two large stones remained (red arrows) but progress had been made! We examined Angel again in early December. She was very comfortable and seemed happy, and Angel was enjoying the prescription food. A third X-ray was obtained. 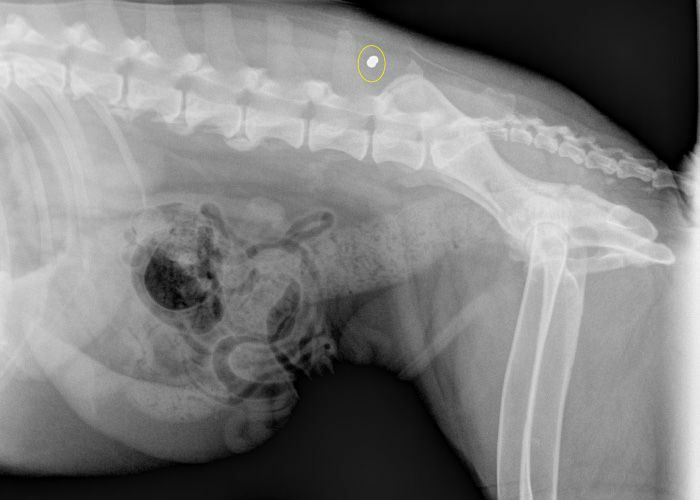 No stones were seen in Angel’s bladder (which is outlined in yellow). 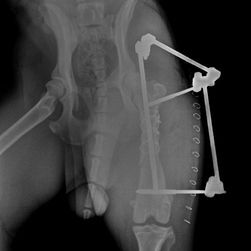 Angel’s owner was very glad that Angel was happy once again, and he was delighted that surgery was not required! This is a very interesting case and demonstrates the power of diet modification in the treatment of a medical condition. However, not all types of bladder stones can be dissolved by changing the pet’s diet. It is very important that treatment is conducted under veterinary supervision and monitoring. 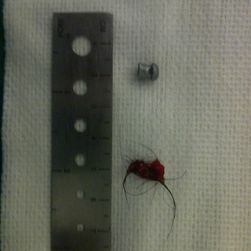 This 12 year old spayed female Lhasa Apso dog was having trouble urinating. She appeared to be painful and passed small volumes of urine repeatedly. Sometimes blood was present in the urine. A sample of her urine was examined at our clinic laboratory and she was placed on antibiotics for treatment of a urinary tract infection. A week after the antibiotic prescription was completed the problem returned. 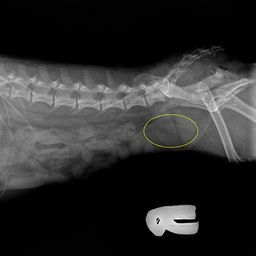 An x-ray of the dog’s abdomen was obtained. Within the bladder several white (dense) stones are seen. 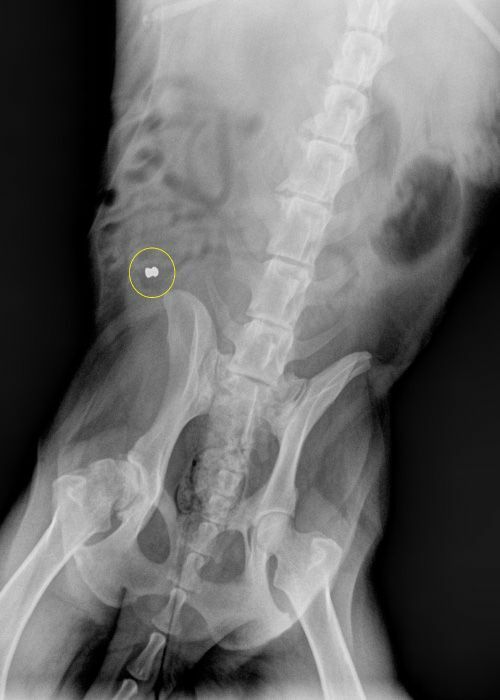 Some types of bladder stones (uroliths) can be dissolved by changing the dog’s diet but the type of bladder stone suspected in this dog must be removed surgically. 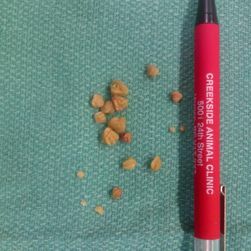 These bladder stones were tan coloured and irregular in form with ridges and sharp points that irritate the lining of the bladder and the urethra. The stones were submitted to a laboratory where they underwent analysis to assist in the long term care of this pet. Although this type of stone is not readily dissolved by dietary modification, it is possible to reduce the risk of stones forming if a specific diet is fed to dogs. 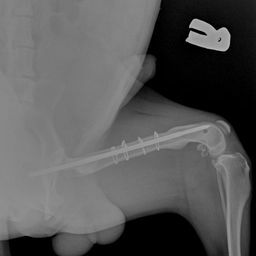 This 10 year old spayed female Labrador Retriever was examined for a small puncture wound above the flank and forward of the hip. The owner was concerned the dog had been impaled by a stick. The wound was circular and seemed to originate from behind the dog which is unusual for an impalement injury. Two x-rays were taken – one from the side and the other from the top to bottom. A very dense object with one domed end and a flared end was seen. This object is circled in yellow. 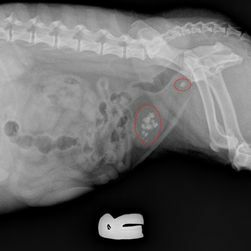 The dog was anesthetized and underwent exploratory surgery to recovery the lead pellet that was buried deeply in the musculature of the lower back. Gun shot and pellet wounds are at risk for becoming infected. As the pellet passes through the skin, it carries with it hair, skin and debris deep into the tissues. This material is laden with bacteria and can result in infections and or abscesses. This dog made an uneventful recovery from surgery. Fortunately no body cavity or organs were punctured. A 35kg male dog was hit by a car. Amongst other injuries, he sustained a broken hind leg which required surgery to repair. 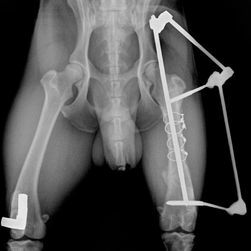 Casts cannot be used on the upper part of a dog’s leg. 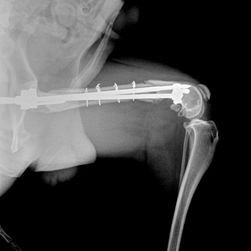 Repair of these fractures is time consuming, costly and requires dedication on the part of the owner. 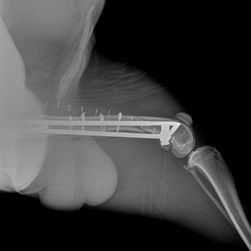 This series of X-ray images show the initial injury, the surgical repair and the progression of changes as healing occurred over 13 weeks. This image shows the femur (large bone of the upper hind leg) broken into three pieces. 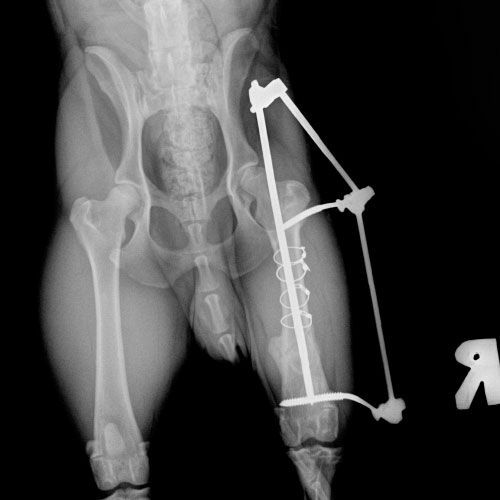 These images are side views and front to back views of the hind leg after surgery was performed. Four wires were placed to tie the large bone fragments together. A large I.M. 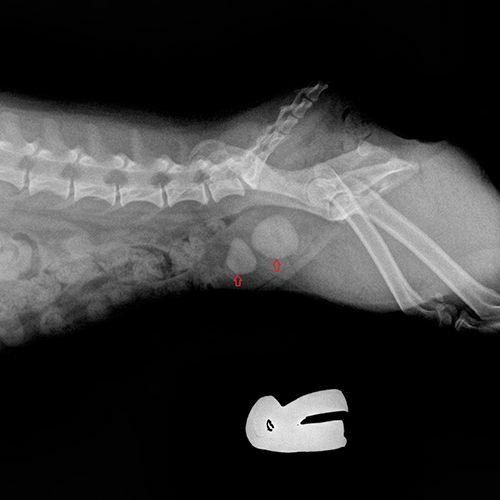 pin was placed lengthwise through the centre of the bone. 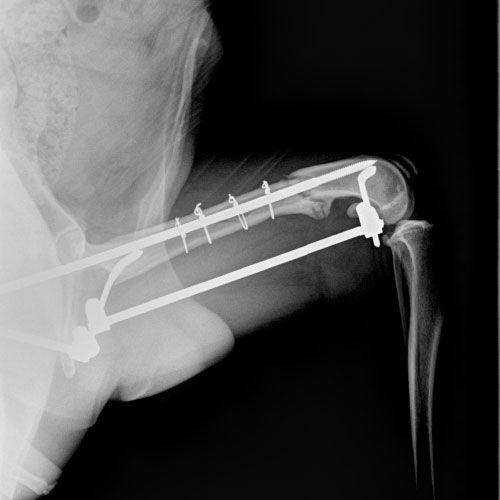 Two pins were applied through the skin and into the bone to stabilize the fracture. Skin staples are seen on the outside of the leg and will be removed two weeks later. 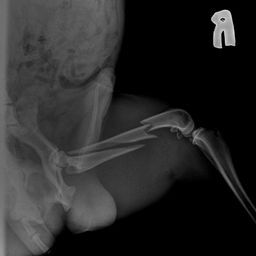 These images were taken a month after surgery and healing has begun. New bone callus is forming across the fracture between the last wire and the knee joint. At almost two months after surgery healing is progressing well. The callus is expanded and the fracture lines (dark areas through the bone) less obvious. Note how the external pins which were initially straight have become bent. This dog was supposed to be rested and kept quiet but was allowed to run. At this point, the external pins were removed. The fracture line is almost completely gone. The area over the fracture is dense and fairly smooth although raised. The bone has healed and the I.M. pin was removed.